New York police have stormed Zuccotti Park, Manhattan, breaking up the celebration marking the six-month anniversary of the OWS movement. Mass arrests have been made. 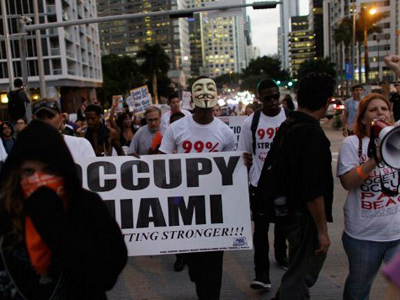 The peaceful rally had gathered almost 600 people to OWS’ founding spot. The NYPD has reported that 73 arrests were made after Saturday night’s demonstrations, but it remains unclear how many are still in custody. Police drafted in public buses to carry away the detained. Police are now seeking a subpoena against an activist sympathizer who tweeted a death threat to the New York police on Saturday. “They won't make a difference if they don't kill a cop or two,” was tweeted about 11:40pm on Saturday. Demonstrators held their ground there locking arms in solidarity as dozens of police swept through the downtown Manhattan Park. Several people were injured in the police assault, with three women being taken away in ambulances from the scene. Many demonstrators accused the police of being unnecessarily aggressive. Twitter users reported broken jaws and thumbs and one man who had his head smashed into a window by police. 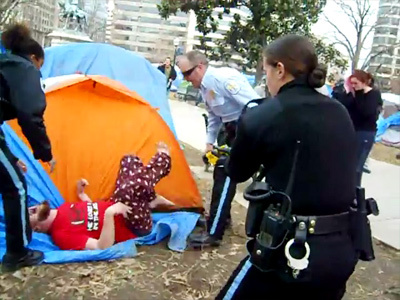 According to eyewitnesses, a woman suffering from a seizure was handcuffed by police and deprived of medical attention for several minutes. “It was a good 10 or 15 minutes before they got an ambulance. I thought, oh no, is this the moment when this woman is going to die right there?” demonstrator, Leslie Kauffman told news agency AFP. New York City police announced Zuccotti Park had closed for the evening before moving through the excited and sometimes agitated protesters, who chanted and beat drums as they went. New York Policeman Brian Sessa told the Associated Press that the police acted because the demonstrators had begun to break park rules. "They set up tents. They had sleeping bags," he said. 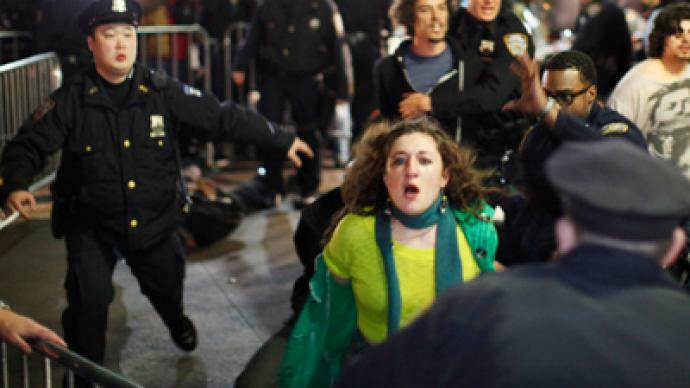 OWS twitter channel reported that after the crackdown at Zuccotti Park, protesters moved on to Union Square where they were met by a large police presence. Saturday’s police crackdown on OWS protesters marks the 6-month anniversary of the anti-capitalist movement since its inception last September in Zuccotti Park. The group gathered significant momentum in the subsequent months, giving rising to copy-cat groups across the US and in major cities around the world. The Occupy movement suffered a significant blow in November when a police crackdown dislodged the group’s main encampment at Zuccotti Park, arresting some 200 hundred people in the process. The group’s existence has been dogged by widespread reports of police brutality being used to disperse protesters. Before arriving at Zuccotti Park, protesters had marched on nearby Wall Street, resulting in another unspecified number of arrests.